The Dallas Cowboys had lost four straight playoff games – their last win coming a decade earlier in 1996 - as they faced the Seattle Seahawks in a Wild Card Playoff game on January 6, 2007. In their fourth season under Head Coach Bill Parcells, the Cowboys were off to a 3-3 start when they replaced veteran QB Drew Bledsoe with unheralded backup Tony Romo. They went 6-4 the rest of the way to finish second in the NFC East at 9-7 and claim a Wild Card spot. Romo tailed off late in the season but still earned selection to the Pro Bowl. Both wide receivers Terrell Owens, in his first year with the Cowboys, and Terry Glenn gained over a thousand yards, Pro Bowl TE Jason Witten was solid, and the running back tandem of Julius Jones and Marion Barber was productive. The Seahawks, coached by Mike Holmgren, had won the NFC title in 2005 and, while they struggled at times in ’06, they also went 9-7 to top the NFC West for the third consecutive year. Injuries were an issue as QB Matt Hasselbeck missed four games and RB Shaun Alexander, who set a record for touchdowns scored in ’05, also missed time with a foot injury. Both had subpar years. The defensive secondary was prone to giving up big plays and the pass rush tailed off as the season progressed. There was a crowd of 68,058 at Seattle’s Qwest Field. The Seahawks had the game’s first possession and drove 55 yards in nine plays. Hasselbeck completed four passes, including one to WR Bobby Engram that gained 36 yards. Josh Brown kicked a 23-yard field goal to give the home team the early lead. 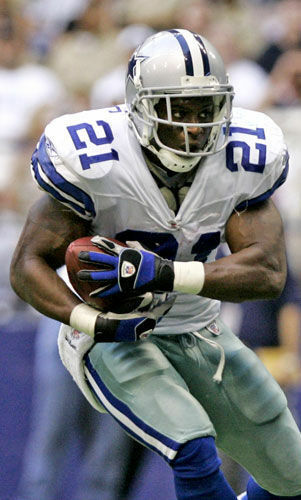 Following a Dallas punt, Hasselbeck was intercepted by CB Anthony Henry to give the Cowboys good field position at the Seattle 43. They made the most of the opportunity as Martin Gramatica booted a 50-yard field goal to tie the score five plays later. That was the tally heading into the second quarter until the Seahawks put together a 13-play series that covered 54 yards. With Hasselbeck completing short passes and Shaun Alexander running the ball, Seattle reached the Dallas 12 from where Brown kicked his second field goal, from 30 yards. Both teams had three-and-out possessions before the Cowboys went 76 yards in ten plays. A third-and-six pass by Tony Romo to WR Patrick Crayton for 18 yards kept the drive alive, as did a throw to Jason Witten for 32 yards to the Seattle three in a fourth-and-two situation. An offensive holding penalty moved the ball back ten yards, but Romo connected with Crayton from there for a touchdown and Dallas took a 10-6 lead into halftime. In the third quarter, and following a short Dallas possession that ended with a punt, the Seahawks briefly regained the lead with a 12-play, 62-yard drive. Five runs by Alexander gained 32 yards, including one for three yards that converted a fourth-and-one situation, and Hasselbeck completed three passes, the last to TE Jerramy Stevens for a 15-yard touchdown. With the successful extra point, it was 13-10 in favor of Seattle – but the lead didn’t last long. The ensuing kickoff was returned 93 yards for a TD by WR Miles Austin and the Cowboys were back in front at 17-13. It was the first touchdown on a kickoff return in Dallas postseason history. That was the score early in the fourth quarter when Hasselbeck went long for WR D.J. Hackett but was picked off by SS Roy Williams after the ball was tipped by CB Terence Newman. Taking over at their own 43, the Cowboys made the most of the turnover by advancing 46 yards in eight plays. Along the way, Romo completed a pass to Terry Glenn for 16 yards and Julius Jones (pictured at right) had an 18-yard run. Gramatica kicked a 29-yard field goal and Dallas extended its lead to 20-13. In the ensuing possession, the Seahawks drove from their 27 yard line to the Dallas two, but an incomplete pass on fourth down forced them to give the ball up. However, on the next play Glenn fumbled after catching a short pass from Romo and, initially, the play was ruled a touchdown on a recovery in the end zone by SS Michael Boulware. Upon review, the call was reversed and ruled a safety with the ball having rolled out of bounds in the end zone. Now down by five points, the Seahawks started off following the free kick with good field position at midfield. Four plays later, Hasselbeck connected with Stevens for a 37-yard touchdown. The try for a two-point conversion failed, but Seattle was now in front by a point. There were still over four minutes remaining on the clock, however – plenty of time for the Cowboys to respond. After Romo completed two passes, with a short run in between, Jones took off for a 35-yard gain to the Seattle 11. They got it down to the two (narrowly missing another first down) and lined up for a potentially game-winning field goal attempt by Gramatica. 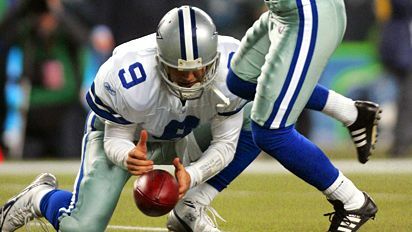 However, Romo, who had been the holder for placekicks far longer than he had been the starting quarterback, fumbled the snap (pictured at top) and had to pick up the loose ball and run with it. He came up short of either a score or a first down as he was tackled by CB Jordan Babineaux at the line of scrimmage. With the stunning reprieve, the Seahawks held on for a 21-20 win. Seattle led in total yards (332 to 284) and first downs (19 to 14). The Seahawks also turned the ball over twice, to one by Dallas. The Cowboys hurt themselves with 8 penalties, at a cost of 74 yards, while Seattle was flagged just three times. Matt Hasselbeck completed 18 of 36 passes for 240 yards and two touchdowns with two intercepted. 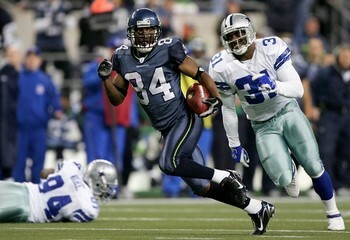 Shaun Alexander ran for 69 yards on 24 carries. Jerramy Stevens caught 5 passes for 77 yards and two TDs while Bobby Engram (pictured below) gained 88 yards on his four receptions. For the Cowboys, Tony Romo was successful on 17 of 29 throws for 189 yards and a touchdown without giving up an interception. Julius Jones had a fine performance running the ball as he gained 112 yards on 22 attempts. Terry Glenn paced the receivers with four pass receptions for 41 yards while Jason Witten contributed 57 yards on three catches. The Seahawks lost another close game, this time in overtime, to the Bears at the Divisional Playoff level. They again topped the NFC West in 2007 while the Cowboys finished first in the NFC East, but both clubs fell in the Divisional round of the postseason. Bill Parcells was not at the helm for Dallas in ’07 – he stepped down as head coach and the loss to Seattle thus marked his finale. His four-year record with the Cowboys was 34-30 with two playoff losses as well. It was the final stop in a head coaching career with four teams that yielded a 172-130-1 regular season record and 11-8 playoff tally that included three conference titles and two Super Bowl victories.